I recently had the privilege to speak with Robert Dudzic and, during the course of our casual discussion, we touched on topics such as his thoughts on the creative process, how to gain access to sites and the power of inspiration. What was your motivation for creating How I use What I use? Everything happened around 2 years ago. A friend of mine had a brother in film school in Boston, and he wanted to do a small documentary. So, my friend suggested to his brother that he could do a small video on how I do my sounds. I thought it was a good idea, but I wanted to make sure that it felt real. I know what I’m doing but, I don’t want to act. So, I agreed, as long as it all just felt real. Everything was improvised. We went to the junkyard and recorded a bunch of footage. About a week later, I got a rough cut to view. I redid all of the sounds for the video with the processed sounds, and that was it. I went to the NAMM show and ran into Ric Viers. He saw it and said, “I have to introduce you to the Rode guys.” He hooked me up with them, and that is how everything started. After I got back from the NAMM show I uploaded the video and, within ten minutes, I had 1,000 views. I was amazed! So, we started making more videos. And, we have been getting a very positive response. I was hesitant to speak on the video at first because I never properly learned English. I moved here in 1990 from Poland, and I learned English from the streets. So, whenever I speak, I’m thinking in Polish, and translating to English. From there, Native Instruments contacted me. I asked them how they found out about me, and they said the How I use what I use video. I said I’ve been try in contact you and I haven’t heard back from you. They said they were just waiting for the right product to approach me about. So, they sent me the Thrill instrument and I was like, Whoa! So, I started a new series called how I use what I use. I wanted to show what I’m using and How I’m using it, and why I’m using it. So, now people are starting to pay attention. How do you deal with fear and rejection? You can’t win unless you first learn how to lose. Learn to take the critiques in a positive way, instead of letting them put you down. Learn for the critiques and move on. People don’t criticize you because they want to hurt your feelings, they want to make you better. When I was in the radio business, it happened a lot. In the beginning, you think you are doing your best work. But, then they bring you in, close the door, and tell you it sucked. In the Trailer war, you have Supervisor, Editor, Focus Groups… so many people involved in the decision process. They will never say they don’t like it, they will just say “we are going in a different direction.” That’s how they say it when it’s not working for them. When they ask you to do a lot of custom sounds, you do, let’s say, 20 of them. Then they use 1 or 2, and that’s huge accomplishment because, you know they didn’t ask only you, they asked a dozen other houses too. So, that’s a big win! After that, people know what to expect from you. If they ask you for your work, just be yourself. They are asking for your sound that you developed. I was asked once if I would write a book about sound design and, to be honest if I could take one trailer I’m working on, I could write an entire book about that one trailer. Because, every sound has a different approach and, every sound has a story. Like, how I approached the sounds, or where the concepts came from. It’s not just what mic I used, and I used this recorder. It’s all about how I do it and why I do it. How do you go about approaching a public service, like a fire station, to get access to record some of those sounds? 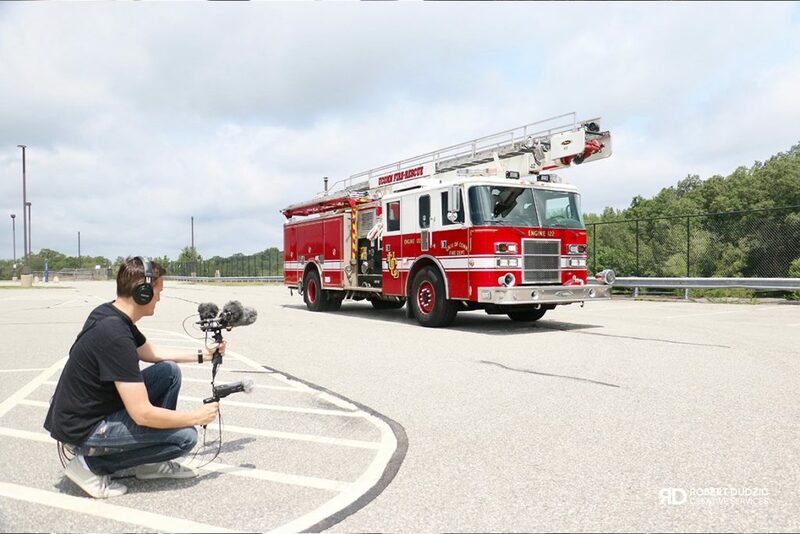 Robert Dudzic Recording Fire Trucks. In the beginning, it’s very hard. Because people are not taking you seriously. First of all, you have to be polite. Be honest, and take “No” as a definite No. Don’t argue with anyone. If you go and tell them that you want to record this stuff for commercial use, you are going to go through so many levels of authorization and clearance. That can be difficult. My advice is to start small, start basic. Go to mom and pop places. Have nice business cards, have a website, and build your credits. It gets easier the more you do it. Practice what you are going to ask. Do your research. Who do you need to talk to, and where do you want to record? Try to find the person in charge and try to talk to them. Find out who is in charge of marketing. A lot of times marketing departments like to do things in exchange. 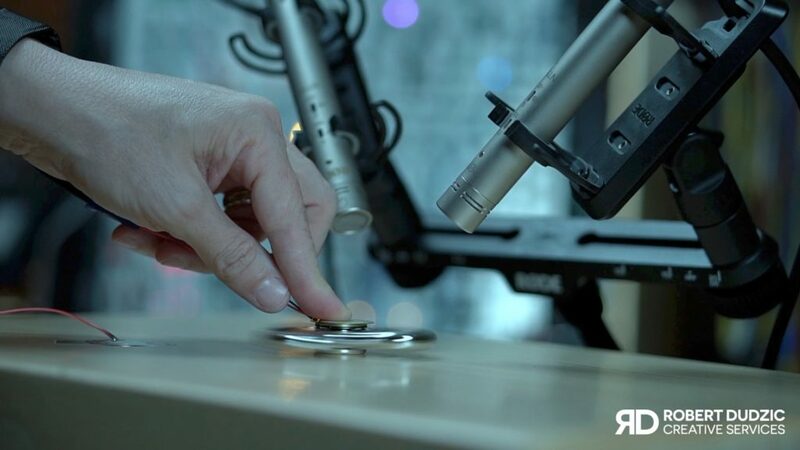 For example, a Bell factory might like to share a unique experience about the sound of their Bells. It would be something they could use on their website and talk about. So, everybody wins. I get so much satisfaction from responses and comments from people about how I’ve motivated or inspired them to start creating or thinking about the way things are done, or how to come up with new sounds. It really makes me feel like I’ve done my job. I always take time to respond to people who reach out to ask questions. How do you stay focused on the project, without getting distracted by the multitude of choices available in today’s software? Robert Recording the mechanical sounds of a VCR. Everything goes back to the radio station days. When you are making your promo, and you are trying to impress another imaging or production guy, you forget about the listeners. The more you start doing crazy stuff, the more you start taking away from the listeners, and you start taking people away from the message. When you take people away from the message, you waste a lot of other people’s time and work. You forget about the average guy who just left work at 5 o’clock and just needs to hear the message. When you add all of these crazy things, you distract from the phone number needed to contact someone about an event, or when the event is taking place. In general, the overall message gets lost. I learned that in the radio business, and I’ve translated this lesson into my approach to the trailer business. It’s my job to support the picture and support the message. It’s not always about the latest plugin that can do some crazy effect, it’s about the impact and connection you make with the viewers. Make sure you leave room for the music, dialog, and all the other elements that go into a trailer. Leave the sounds as organic as you can. Don’t add a lot of compressions and frequencies that are going to clash with all the other elements. Companies will always add stuff as they need it. Compress it again and after all of that, it still goes to mastering. So, if you have too many things going on, it takes away from the message; and, they might not ever use you again. Using too many plugins and adding too many elements can make it muddy, don’t overproduce it. When you record something like ambience, and you add anything to the sound, you are taking away from the originality of that sound. Don’t buy the latest plugin that’s promising to make you sound bigger and better. Spend your money on a nice handheld recorder, or a decent microphone. Because people close their eyes and want to feel it, they want to believe it. They want to feel like there are there. Finding new sounds. The Fidget Spinner. How do you keep your creativity flowing towards productivity, without losing the spark of inspiration that keeps things new and exciting? I love Home Depot! I love going there and looking around for ideas. I’m building a new little foley stage. So, I can use multiple things at the same time. I’ll be able to create very unique sounds and really perform them. To people who are insecure and afraid to share their secrets and what tools they use, I like to think the is no secret what tool we use. For example, I like to compare them to writers saying everyone can go to Staples or convince store and buy notebook and pen, is no secret this the tools what writers are using to write the book, buying this will not give you the power to write for examples like James Paterson or Dan Brown. You have to find out who you are, be yourself and write the way you like and what makes you happy. Don’t pretend to be someone else. Be honest and be yourself and that’s your key to success and happiness.